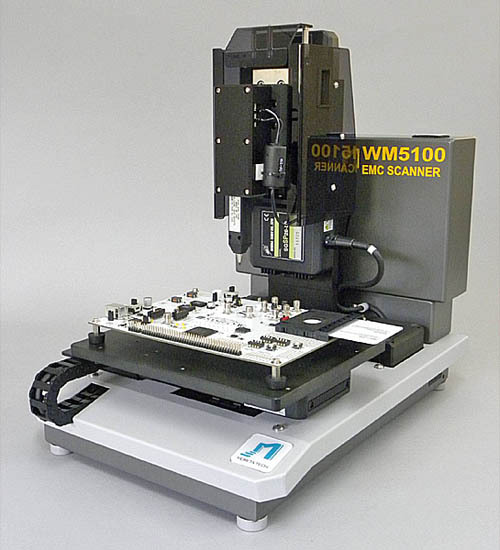 The EMC scanner WM5100 is a compact version of the WM7000 series, which is equipped with the high-gain EM probe MT-545 was desinged for EMA (Electro-Magnetic Analysis) experiments using the SASEBO and SAKURA boards. The barods are set on a stage using supecial jig, and EM radiation from an FGA or an IC card is masured in a area of 50mm x 50mm. A distance between the target chip and the EM probe head can be kept constant by using a lazer range finder. This produc is provided from Morita-Tech only for Japanese domestic market.